In response to President Barack Obama’s Climate Data Initiative, which encourages tech innovators to use data in compelling ways to help make smart choices in the face of climate change, Esri Silver Tier partner CitySourced created EveryDrop, a water conservation website and app that engages citizens by giving them an easy way to report water waste and educates them in ways to better conserve water. To identify and report water waste, the user simply opens the app, snaps a photo of the problem, uses the GPS capabilities of the device to provide a location, and clicks a button in the app to submit the issue. Using location and various other factors, the report is automatically routed to the correct agency and department so users don’t have to know who is responsible for responding to the issue. For example, the Indio Water Authority in Southern California is integrating water loss reports directly into its Cityworks Asset Management System so operations staff don’t have to manage and administer a new software system. Crowdsourced reports from EveryDrop are integrated into the existing workflow, which saves time and ultimately reduces costs. For organizations not currently using a software tracking system, EveryDrop’s web-based management Console gives water agencies full control over the submitted water waste reports. Departments can be automatically notified based on configurable rules, conditions, and other user-submitted data such as location. Additionally, executive leadership can use the Console to see what, where, and how frequently water waste is being reported. According to the National Weather Service, 2013 was the driest calendar year on record since 1877. The southwest United States, particularly California, has been experiencing a serious drought and desperately needs rain. The primary intervention strategy for water agencies in combating this problem is reducing water consumption and water waste. Daily usage can be reduced through targeted marketing campaigns that encourage the public to cut back on total water usage and restrict unnecessary watering patterns. For example, watering lawns and washing cars are nonessential activities that result in water waste and need to be greatly restricted during times of drought. However, limiting water waste can be a difficult and nontrivial task for water agencies. Wasting as little as one drop per minute (the rate of water loss from a leaky faucet) equates to over 2,000 gallons of water wasted per year. Water agencies have field crews to combat water waste, but they can only tackle issues they know about. Members of the public may not know who to call or how to report water waste, which results in citizen disengagement, apathy, and frustration. Fortunately, public-facing reporting tools such as smartphone apps, have emerged. These tools greatly simplify the process of reporting water waste. Most important, these reports go straight to the water agencies that address these problems. By turning to the public and enabling the citizens to report water waste, agencies can become aware of waste issues more quickly. In response to President Barack Obama’s Climate Data Initiative, which encourages tech innovators to use data in compelling ways to help make smart choices in the face of climate change, Esri Silver Tier partner CitySourced created EveryDrop, a water conservation website and app that engages citizens by giving them an easy way to report water waste and educates them in ways to better conserve water. For the public, EveryDrop is available both as a website and a downloadable app for Android and iPhone. The app allows users to Identify and report water waste directly View incidents of water waste around them Receive alerts to conserve when it’s absolutely essential Educate themselves on conservation techniques Engage with the water community through social media To identify and report water waste, the user simply opens the app, snaps a photo of the problem, uses the GPS capabilities of the device to provide a location, and clicks a button in the app to submit the issue. Using location and various other factors, the report is automatically routed to the correct agency and department so users don’t have to know who is responsible for responding to the issue. Cities, counties, and water districts that deploy EveryDrop gain full control over how water waste reports are routed internally. They can create workflows that immediately notify staff and other agencies of any issues reported. In addition, agencies can push these reports into existing work order management systems. For example, the Indio Water Authority in Southern California is integrating water loss reports directly into its Cityworks Asset Management System so operations staff don’t have to manage and administer a new software system. Crowdsourced reports from EveryDrop are integrated into the existing workflow, which saves time and ultimately reduces costs. For organizations not currently using a software tracking system, EveryDrop’s web-based management Console gives water agencies full control over the submitted water waste reports. Departments can be automatically notified based on configurable rules, conditions, and other user-submitted data such as location. Additionally, executive leadership can use the Console to see what, where, and how frequently water waste is being reported. EveryDrop is tightly integrated with mapping technology from Esri. 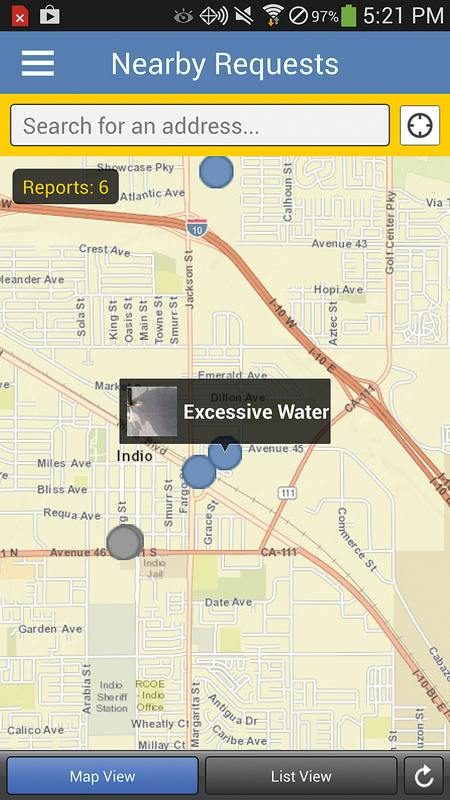 GIS technicians at the Indio Water Authority leverage ArcGIS for Server and ArcGIS Online to produce valuable insights on water loss, which can be fed back to colleagues and the public in an effort to produce long-term, actionable change. They use EveryDrop in conjunction with Esri technology to push reports directly into an ArcGIS feature service, use a service on ArcGIS Online to reproject that data, and query ArcGIS feature services in real time. Taking this integration one step further, ArcGIS for Server or ArcGIS Online users are monitoring key performance indicators (KPIs) inside Operations Dashboard for ArcGIS, available as a Windows app for the desktop or browser app for online or tablet viewing. For example, water department operation teams are quantifying how much water is being wasted. This data is then analyzed to make better decisions; displayed on maps for visualization; and summarized in charts and graphs for reporting to executive leadership. Water agencies are looking for new, innovative methods to engage citizens in their fight to reduce water waste. Agencies are increasingly turning to technologies like EveryDrop to streamline reporting and response to water waste. Employing this GIS-based technology allows the public to be better served, helps conserve precious and limited water resources, and allows better decisions. For more information, contact Andrew Kirk, vice president, sales and marketing, at CitySourced at 424-270-9438. Cities, counties, and water districts that deploy EveryDrop gain full control over how water waste reports are routed internally. They can create workflows that immediately notify staff and other agencies of any issues reported. In addition, agencies can push these reports into existing work order management systems. For example, the Indio Water Authority in Southern California is integrating water loss reports directly into its Cityworks Asset Management System so operations staff don’t have to manage and administer a new software system. Crowdsourced reports from EveryDrop are integrated into the existing workflow, which saves time and ultimately reduces costs. For organizations not currently using a software tracking system, EveryDrop’s web-based management Console gives water agencies full control over the submitted water waste reports. Departments can be automatically notified based on configurable rules, conditions, and other user-submitted data such as location. Additionally, executive leadership can use the Console to see what, where, and how frequently water waste is being reported. EveryDrop is tightly integrated with mapping technology from Esri. 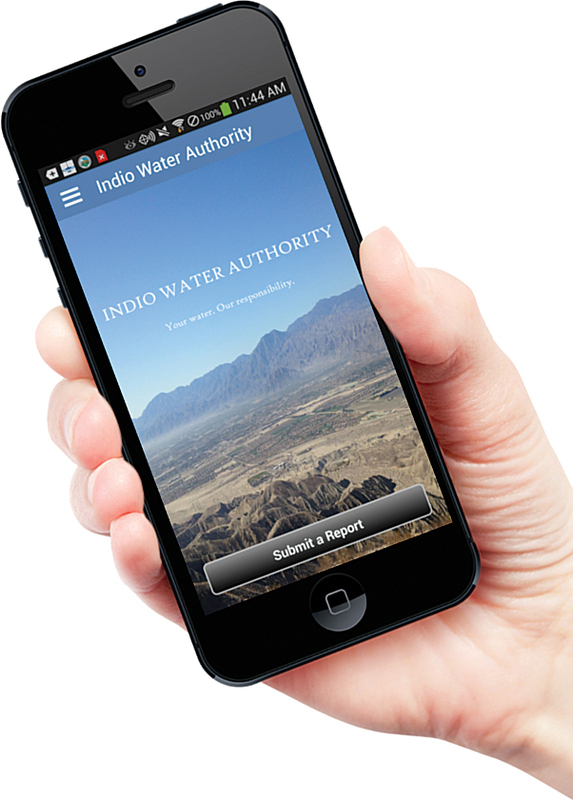 GIS technicians at the Indio Water Authority leverage ArcGIS for Server and ArcGIS Online to produce valuable insights on water loss, which can be fed back to colleagues and the public in an effort to produce long-term, actionable change. They use EveryDrop in conjunction with Esri technology to push reports directly into an ArcGIS feature service, use a service on ArcGIS Online to reproject that data, and query ArcGIS feature services in real time. Taking this integration one step further, ArcGIS for Server or ArcGIS Online users are monitoring key performance indicators (KPIs) inside Operations Dashboard for ArcGIS, available as a Windows app for the desktop or browser app for online or tablet viewing. For example, water department operation teams are quantifying how much water is being wasted. This data is then analyzed to make better decisions; displayed on maps for visualization; and summarized in charts and graphs for reporting to executive leadership. Water agencies are looking for new, innovative methods to engage citizens in their fight to reduce water waste. Agencies are increasingly turning to technologies like EveryDrop to streamline reporting and response to water waste. Employing this GIS-based technology allows the public to be better served, helps conserve precious and limited water resources, and allows better decisions. For more information, contact Andrew Kirk, vice president, sales and marketing, at CitySourced at 424-270-9438. According to the National Weather Service, 2013 was the driest calendar year on record since 1877. The southwest United States, particularly California, has been experiencing a serious drought and desperately needs rain. The primary intervention strategy for water agencies in combating this problem is reducing water consumption and water waste. Daily usage can be reduced through targeted marketing campaigns that encourage the public to cut back on total water usage and restrict unnecessary watering patterns. For example, watering lawns and washing cars are nonessential activities that result in water waste and need to be greatly restricted during times of drought. However, limiting water waste can be a difficult and nontrivial task for water agencies. Wasting as little as one drop per minute (the rate of water loss from a leaky faucet) equates to over 2,000 gallons of water wasted per year. Water agencies have field crews to combat water waste, but they can only tackle issues they know about. Members of the public may not know who to call or how to report water waste, which results in citizen disengagement, apathy, and frustration. Fortunately, public-facing reporting tools such as smartphone apps, have emerged. These tools greatly simplify the process of reporting water waste. Most important, these reports go straight to the water agencies that address these problems. By turning to the public and enabling the citizens to report water waste, agencies can become aware of waste issues more quickly. In response to President Barack Obama’s Climate Data Initiative, which encourages tech innovators to use data in compelling ways to help make smart choices in the face of climate change, Esri Silver Tier partner CitySourced created EveryDrop, a water conservation website and app that engages citizens by giving them an easy way to report water waste and educates them in ways to better conserve water. For the public, EveryDrop is available both as a website and a downloadable app for Android and iPhone. The app allows users to Identify and report water waste directly View incidents of water waste around them Receive alerts to conserve when it’s absolutely essential Educate themselves on conservation techniques Engage with the water community through social media To identify and report water waste, the user simply opens the app, snaps a photo of the problem, uses the GPS capabilities of the device to provide a location, and clicks a button in the app to submit the issue. Using location and various other factors, the report is automatically routed to the correct agency and department so users don’t have to know who is responsible for responding to the issue. According to the National Weather Service, 2013 was the driest calendar year on record since 1877. The southwest United States, particularly California, has been experiencing a serious drought and desperately needs rain. The primary intervention strategy for water agencies in combating this problem is reducing water consumption and water waste. Daily usage can be reduced through targeted marketing campaigns that encourage the public to cut back on total water usage and restrict unnecessary watering patterns. For example, watering lawns and washing cars are nonessential activities that result in water waste and need to be greatly restricted during times of drought. However, limiting water waste can be a difficult and nontrivial task for water agencies. Wasting as little as one drop per minute (the rate of water loss from a leaky faucet) equates to over 2,000 gallons of water wasted per year. Water agencies have field crews to combat water waste, but they can only tackle issues they know about. Members of the public may not know who to call or how to report water waste, which results in citizen disengagement, apathy, and frustration. Fortunately, public-facing reporting tools such as smartphone apps, have emerged. These tools greatly simplify the process of reporting water waste. Most important, these reports go straight to the water agencies that address these problems. By turning to the public and enabling the citizens to report water waste, agencies can become aware of waste issues more quickly. In response to President Barack Obama’s Climate Data Initiative, which encourages tech innovators to use data in compelling ways to help make smart choices in the face of climate change, Esri Silver Tier partner CitySourced created EveryDrop, a water conservation website and app that engages citizens by giving them an easy way to report water waste and educates them in ways to better conserve water. For the public, EveryDrop is available both as a website and a downloadable app for Android and iPhone. The app allows users to Identify and report water waste directly View incidents of water waste around them Receive alerts to conserve when it’s absolutely essential Educate themselves on conservation techniques Engage with the water community through social media To identify and report water waste, the user simply opens the app, snaps a photo of the problem, uses the GPS capabilities of the device to provide a location, and clicks a button in the app to submit the issue. Using location and various other factors, the report is automatically routed to the correct agency and department so users don’t have to know who is responsible for responding to the issue.